I've been thinking recently about the accuracy of state-wide elections in the USA, or rather the lack thereof as exemplified by the Minnesota Senatorial election (excruciating detail at fivethirtyeight.com). After the first count Norm Coleman, the incumbent, led by 215 votes out of 2.9 million cast, a margin of victory of less than one hundreth of one percent. Thus began a recount, with various stages of challenges and disputes and opening of this or that set of ballots. The result, as of yesterday, was a 225 vote lead for Al Franken, the challenger. Now begins a series of Supreme Court rulings (reminiscent of Florida 2000) on additional ballots, procedures etc. All of this leads me to believe that it is simply not possible to resolve this election in a way which leads to the 'true winner' to be found. Both sides have spouted forth a lot of rhetoric about counting every vote, heeding the will of the people etc, but in reality, nobody will ever know who won this race. It is simply too close, and the exact margin depends on subjective challenges, human errors and oversights. In fact, it's possible there is no objective truth about the election. 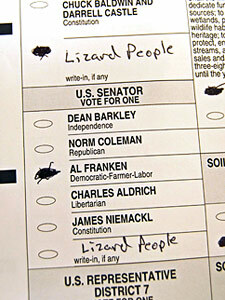 Even if you could go ask everyone who voted that day whom they voted for, some people probably couldn't remember, and what exactly does it mean to write Lizard People on your ballot?